In the last decade Hitachi hasn’t done much on an online level in Australia. The management team decided it was time to give their brand the online presence they deserved. Up until now, their different departments were un-unified through different platforms and systems, their web strategy was affecting their business sales and overall performances. Verdikt in partnership with the internal marketing team of Hitachi decided to develop a centralised system. A responsive website built on the robust ASP.NET Orchard CMS and integrated with a large amount of API connections which communicate seamlessly with their different management tools (CRM, ERP, Marketo…). 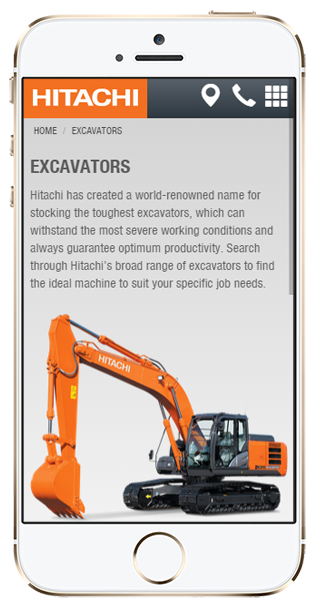 Hitachi’s new website unlocks their sales potential. This content rich and easy to use platform helps their customers build long-term relationships with their brand and increases their overall presence in the Australian’s machinery equipment world as a market leader.